t's the first "Faculty Friday" of 2018, and your chance to get to know History Prof. @RICKY LAW! 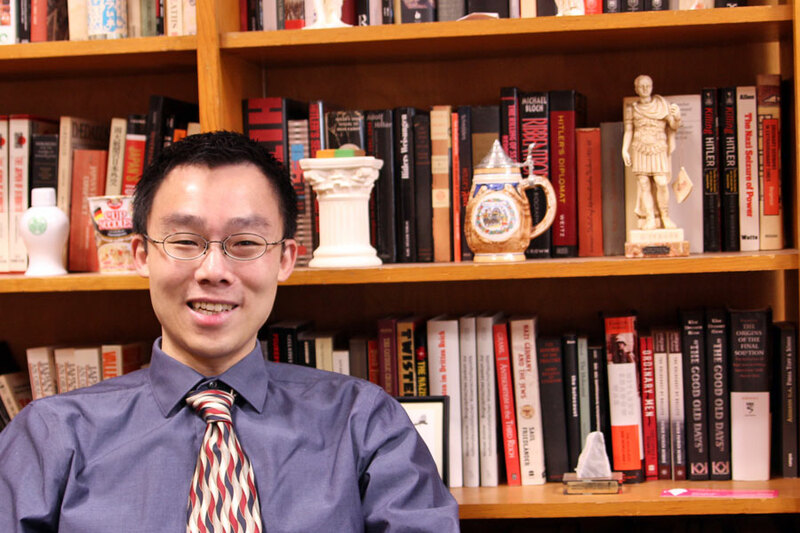 Professor Ricky Law's office is cozily lit with lamps, and surrounding his desk are shelves filled with books in English, German, Latin, and Japanese. Miniature statues from around the classical world perch throughout the office, evidence of his love of Roman history. When asked about his favorite Roman monument, he thinks about it. "Probably the Appian Way," he says, referring to an ancient Roman road. "If you're in Rome, you can just follow it out of the city. The crowds thin out, and eventually it's just the Roman road and you, with monuments all around. It's an unreal experience." But for all his current love of history, he didn't start out studying history. "Originally, I was studying electrical engineering! At least, I was until I had an epiphany. I saw the light - literally! I remember it perfectly. It was my Freshman year, on a Friday evening in November, and it was a beautiful night, getting dark, getting cool. And as I was walking home, I passed by the engineering building, and I could see a lot of people inside, a lot of people sitting and staring at screens. And I asked myself: Was that what I wanted to do with my life on my Friday evenings? And that's when I realized: The answer was no! Of course," he says, laughing and indicating his glowing computer on his desk. "I guess that's sort of what I do now!" He followed through on his epiphany, and made the switch from Electrical Engineering to a double major in History and German. "For someone growing up in California, German's an exotic language! I thought, if I'm going to rebel anyway, I might as well go all the way." Eventually, he saw a flier for a study abroad opportunity. "I had never considered studying abroad before, but I did it. And looking back, studying in Germany is something I don't ever think on - even for a moment - with regret. I never revisit the decision, or wonder what my life would be like if I hadn't." After graduating and teaching English in Japan for a while, he returned and earned his PhD in history. "Officially, I'm a Global Historian. But I prefer to think of myself as a Transnational Historian. A study of the motion of things, of transaction, transportation." There's time for one last question before our interview concludes: If he had to rename himself after a Roman emperor, which would he choose? He laughs and thinks about it. "At first, I thought maybe Justinian," he says smiling. "But I'd probably choose Julian - the last of the classical emperors." Professor Law teaches excellent Global History (79-104) courses, one on the History of Democracy and another on Death and Destruction: Genocides and Weapons of Mass Destruction. Keep an eye out for them!